The Supreme Court's "Political Question Doctrine"
The Issues: What is a "political question"? When has a matter of constitutional interpretation been committed to another branch? The political question doctrine could be read narrowly or more broadly. Read narrowly, the political question doctrine should be invoked only when the issue presented to the Court is one that "has been textually committed to another branch of government." That is, if the framers of the Constitution made clear their intention that the judiciary not resolve a particular question of constitutional interpretation, that determination must be respected. More broadly, the political question doctrine might be invoked when there is a lack of judicially manageable standards to decide the case on the merits, when judicial intervention might show insufficient respect for other branches of government, or when a judicial decision might threaten the integrity of the judicial branch. 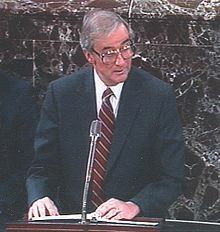 In Baker v Carr (1962), the Court concluded that the political question doctrine did not bar courts from reaching the merits of a challenge brought against Tennessee's system of apportioning its state legislature. Although the case was "political" in the sense that it was about politics, and there were questions about how courts might grant relief if Tennessee's apportionment scheme was declared unconstitutional, the Court saw neither as reasons for invocation of the political question doctrine. (6) or the potentiality of embarrassment from multifarious pronouncements by various departments on one question." In Powell v McCormack (1969), the Court also rejected an argument that the case ought to be dismissed as presenting a political question. 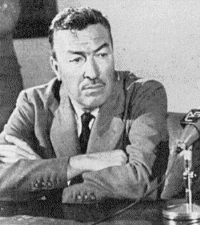 The Court concluded, in a case involving the refusal of the House of Representatives to seat Adam Clayton Powell, that the decision to exclude members was not textually committed to the House--with the exception of criteria identified in Article I, Section 5 relating to age, citizenship, and state residency. Since the refusal to seat Powell was based on a determination that Powell had acted unethically prior to his election, the Court found the exclusion not authorized by Article I and ordered Powell's seating. In Nixon v United States (`1993), the Court found a textual commitment to the Senate of the manner in which it might "try" a federal officer for impeachment. Judge Walter Nixon, convicted in an impeachment proceeding for accepting a bribe, argued that the Senate proceeding violated the Constitution because under Senate impeachment rules he was allowed to bring certain evidence only before a Senate Committee, not the full Senate. The Court refused to interpret the word "try," concluding that the framers reserved that question for the Senate itself to answer. Finally, in Vieth v Jubelirer (2004) considered whether cases involving claims of partisan gerrymandering are constitutional. The Court divided 4-1-4 in Vieth on the issue of whether judicially manageable standards existed that could be used to decide such cases. Four justices saw claims of partisan gerrymandering as presenting a non-justiciable political question, four justices believed that standards existed or could be developed to decide such cases, and one justice (Kennedy) stood in the middle, writing a concurring opinion that suggested he had doubts about the ability of the Court to develop judicially-manageable standards, but was unwilling to rule out the possibility completely. (Interestingly, Kennedy hinted that gross cases of partisan gerrymandering might violate the First Amendment, not the Equal Protection Clause, as most other justices see as the better basis for challenging such laws.) Kennedy presumably voted with the majority in a subsequent case challenging a reapportionment scheme in Texas pushed by Republican House Majority Leader Tom DeLay, designed to eliminate as many as possible House Democrats from Texas. The Court ordered the case sent back to the lower courts to determine whether the Texas reapportionment plan violated the Constitution. [N]or shall any State...deny to any person within its jurisdiction the equal protection of the laws. Questions 1. Which of the following reasons seem to justify dismissal of a case as "a political question": (1) textual commitment of a decision to another branch, (2) presentation of an issue so momentous that to decide it threatens the Court as an institution, (3) presentation of an issue that cannot be decided by "judicial reasoning," (4) the unavailabilty of effective judicial means of redressing a legal violation if one is found, (5) the case raises serious issues of national security, (6) decision in the case would likely embarrass another branch of government, and (7) presentation of an issue that the court "can't get a handle on"? Which of the above are the strongest reasons for dismissing a case? 2. Have Justice Frankfurter's concerns about the courts involving themselves in matters of legislative reapportionment (see Baker v Carr) proven well-founded? 3. How would our state politics be different today if Baker v Carr had come out the other way? Would, for example, the Tennessee legislature still be badly apportioned if the courts had not intervened? 4. If the Senate were to convict a federal judge (or the President) after a "trial" in which the impeached official was denied any opportunity to present evidence, would the Court still refuse to review the action on the ground that it was a political question? 5. What should be made of Justice Kennedy's concurring opinion in Vieth? Justice Kennedy clearly is disgusted with the degree of partisan gerrymandering, but can't yet find a workable test for deciding when a redistricting plan might violate the Constitution. Does that mean that he agrees that these cases present non-justiciable questions (at least until such a test can be found)? Note that there are only four clear votes in Vieth for finding cases challenging political discrimination in redistricting plans to be non-justiciable, so Kennedy's opinion is key. Democratic members of Congress. (Austin Chronicle). 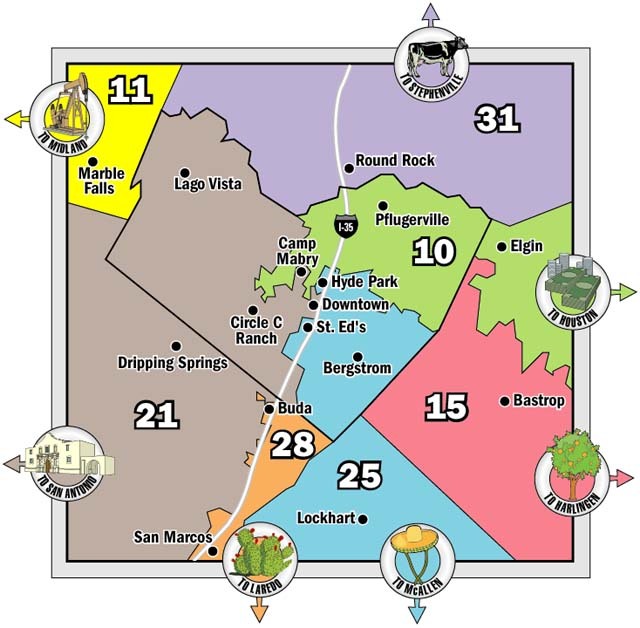 Link to close up of central Texas (boxed portion of map). 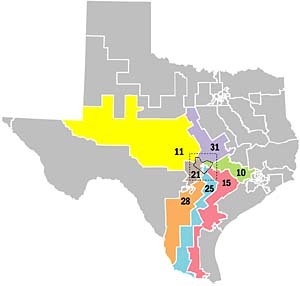 In 2006, the Supreme Court, in League of Latin American Citizens v Perry, revisited the issue of the legality of Tom DeLay's plan for reapportioning Texas. The Court remained unconvinced that a meaningful standard for judging partisan gerrymandering existed--thus seemingly giving the greenlight to partisan map-drawing whenever one party controls both state houses and the governorship. The Court did, however, find that one of the redrawn districts discriminated against Latino voters in violation of the Voting Rights Act and ordered that district lines be redrawn to restore Latino voting power to its pre-existing state.